A nice lower priced set with a highly sought after minifigure (Jango Fett). A great addition to the "Bad guy" sets in a wave dominated by "good guy" sets. 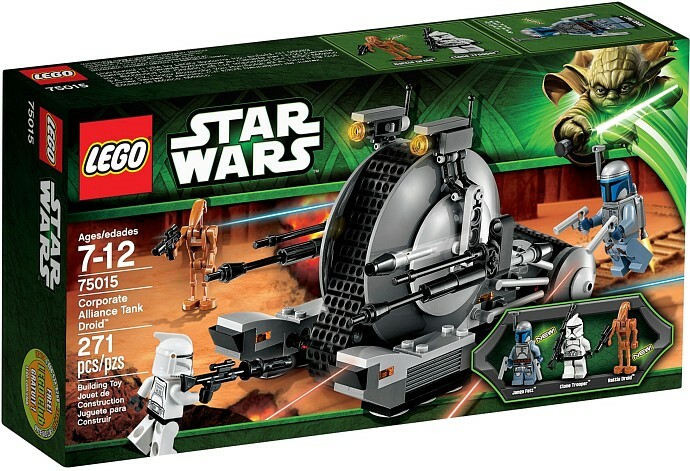 The LEGO 2103 Corporate Alliance Tank (75015) is part of the LEGO Star Wars Sets 2013 wave released mid-year in the US Summer. The LEGO 2103 Corporate Alliance Tank is a remake of a set from 2009, set 7748, which was also called the Corporate Alliance Tank Droid. The vehicle, a NR-N99 Persuader-class droid enforcer, first appeared in Star Wars Episode Two: Attack Of The Clones at the Battle of Geonosis and then again in Episode Three: Revenge Of The Sith when the Corporate Alliance began to attack the Wookie homeworld of Kashyyyk. The main appeal of this new set is the presence of the bounty hunter Jango Fett minifigure, a much sought after figure that has only appeared in one other set, Jango Fett’s Slave 1 and sells for hundreds of dollar on the secondary market. Because of this minifigure, the set could become a popular Lego kit for collectors. Fight against Corporate Alliance Tank Droid LEGO Star Wars! Build the great battle of Geonosis where separatist forces advancing on the Jedi Knights and their clone army with the Corporate Alliance Tank Droid LEGO Star Wars !Help clones to repel the overwhelming caterpillar soldiers and two missiles droid! Then pushes the battle droid and the infamous hunter Jango Fett. • Advance on all terrains and crush your enemy with large caterpillars! • Recreate the epic battles of Star Wars : Episode II Attack of the Clones ! • Recreate a battle of Geonosis even greater with the Homing Spider Droid models 75016, 75019 and AT-TE 75021 Republic Gunship ! Check out the other LEGO Star Wars Sets 2013 sets released in this wave and don’t forget to sign up to our Lego Newsletter for updates.